Metro Development LLC is seeking approval to rezone 24 acres on the east side of Delaware in order to construct Seattle House Apartments — a 240-unit apartment complex. Pictured is the proposed site on Bowtown Road, just north of US 36/SR 37. Barely visible in the background is Glennwood Commons (Meijer, Kohl’s). A 240-unit apartment complex, named Seattle House Apartments, has been proposed on more than 24 acres located north of U.S. Route 36/state Route 37 and south of Bowtown Road in the city of Delaware. The Delaware Planning Commission listened to and voted to recommend the preliminary development plan presented by Metro Development LLC at Wednesday’s meeting. The 240 units would be divided into 10 three-story buildings and would include 60 one-bedroom and 180 two-bedroom units. The size of the apartments would range from 678 to 933 square feet. Amenities included in the proposed development include a clubhouse and pool, as well as an outdoor grill. Joe Thomas, of Metro Development, said the clubhouse would include 24-hour emergency service, a professional cardio center, a gaming center, and a resident office space that will have desktop computers, printers and scanners. City staff is recommending more amenities be included in the proposal, with ideas such as a recreational field or a dog park being mentioned. Developers have conducted a traffic impact study that is currently being reviewed by the city. As a condition of approval, the developers will be responsible for the improvements and/0r financial obligations to the study, per the city and county engineers. Thomas said the expected target yearly income for residents will be $40,000 for one-bedroom units and $75,000 for the two-bedroom units. He added the expected cost to rent will range from $900 to $1,200 a month. Efland clarified his earlier comments about affordable housing, stating he was not calling the proposed Seattle House Apartments affordable, but rather “labor force housing.” He said that in talking with economic development professionals, the average salary for jobs such as those in the Industrial Park area was $17 per hour, making a development such as these apartments labor force housing. Among the concerns voiced by residents who live nearby were density, the three-story scale of the buildings compared to the 6-foot mounding proposed, handicap accessibility, and, of course, traffic implications. Thomas, in talking about handicap accessibility, said one-third of the units will include features such as lower thermostats and roll-under sinks and counters to make them handicap-friendly. Before the preliminary plan can move to a final development plan, council will need to approve the rezoning of the parcel of land in question. Currently, the land is zoned R-6 (Multi-Family Residential District) and B-3 (Community Business District). The rezoning amendment seeks to change the land to R-6 and B-3 (Planned Mixed Use Overlay District). In addition to the rezoning amendment, Metro Development LLC is also seeking council’s approval for a conditional use permit that would allow the placement of a Planned Mixed Use Overlay District on the 24.212 acres. 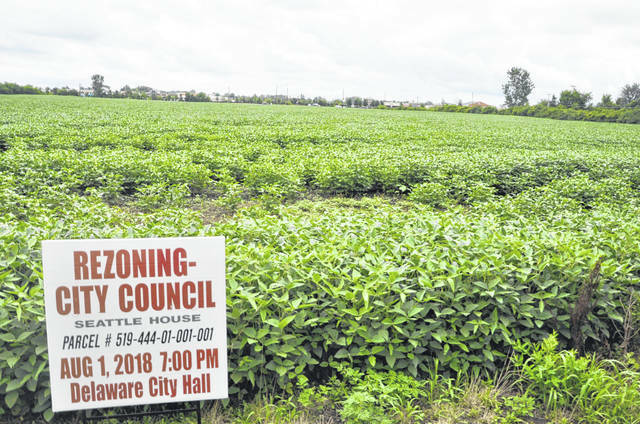 The next step in the process is for the rezoning amendment, conditional use permit request, and preliminary development plan to appear before Delaware City Council for first readings, at which time a public hearing date will be set. The next city council meeting is scheduled for Monday, Aug. 13. Meetings begin at 7 p.m.